Congratulations to Marianna Steele who won 57 blocks in our January BOM lottery! Members in good standing and guests are invited to participate in the monthly block lottery. Make one or more blocks in the design of the month, using the colors specified in the tutorials. Details will be published here each month. Blocks should be turned in before the meeting begins. Participants will be given one ticket for each correctly completed block. One winner will be drawn at random, and will be awarded all of the blocks! Each month’s winner also gets a BOM winner button. Any winner who completes a quilt from 2017 BOM blocks—and brings it for show & tell before the end of the year—will win a fabric bundle! Members should note how many BOM blocks they are entering in the draw, when they drop them off at the beginning of the meeting. Why? Because the member who makes the most BOM blocks in 2017 will win a big prize!! Ingrid quilt by Krista Fleckenstein. 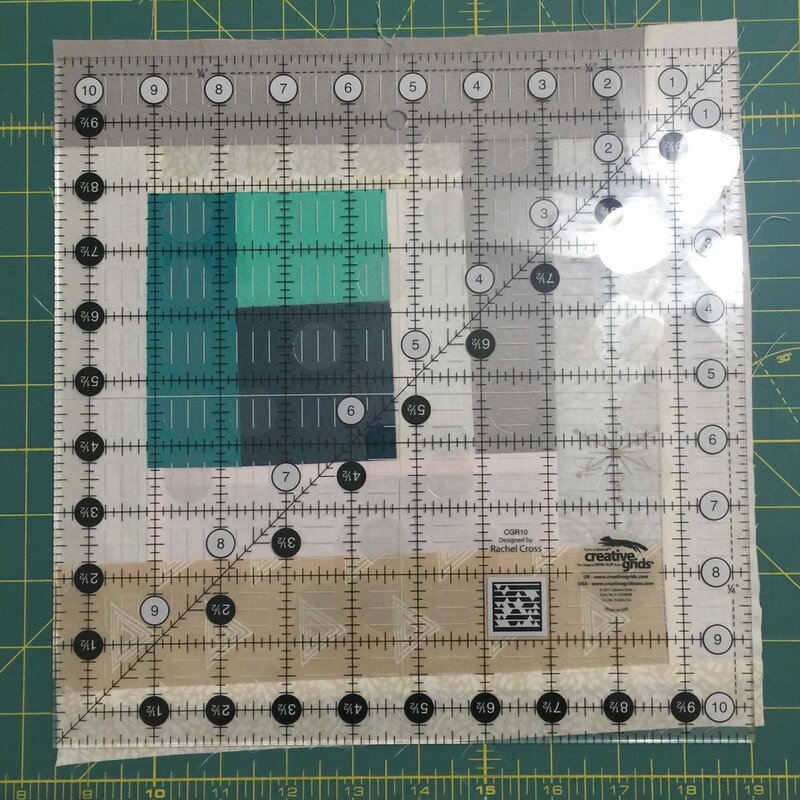 This month we are going to be doing another log cabin block; however, this one is improv (a favorite of many of our members) instead of precision piecing! 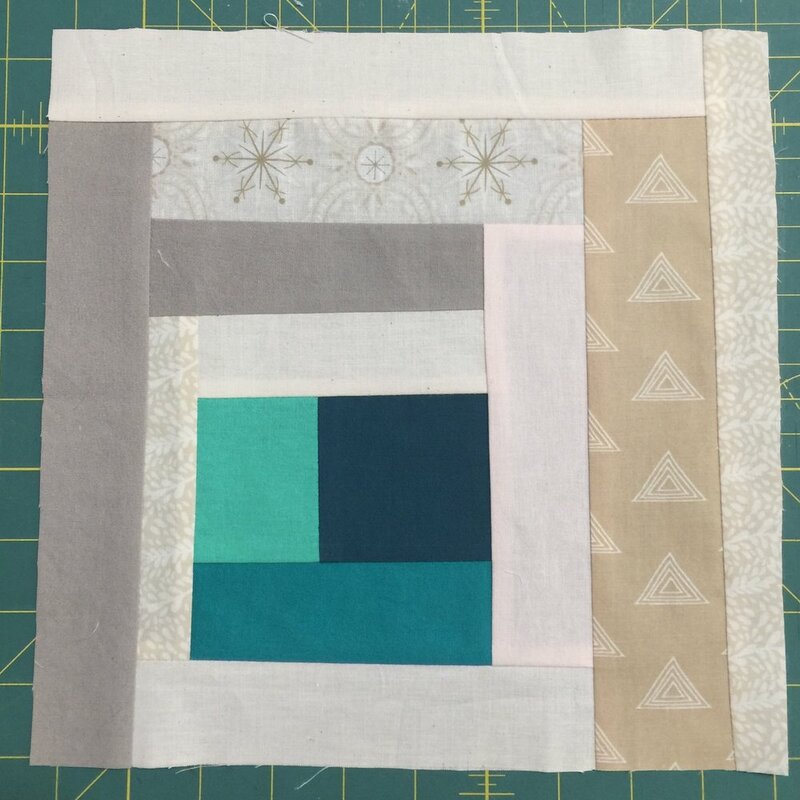 This block was inspired by Krista Fleckenstein, who blogs at Spotted Stones. In turn, her quilt was inspired by one of Ingrid Press’s quilts that was photographed in the Birmingham Festival of Quilts. It is fittingly named Ingrid. Krista loved her use of a single color in each block, with logs of varying neutrals. We call this block the Improv Medallion Log Cabin, because it is all of those things. It’s a medallion because of the color pop rectangle you build upon. It is improv because “anything goes” with the log strip widths and you can start with a pop of color of any size. What makes this quilt really wonderful, in our opinion, is the off-centered medallions and the extra interest and texture added by the off-white low volume logs. Keeping these things in mind, choose your fabrics and construct the block accordingly. 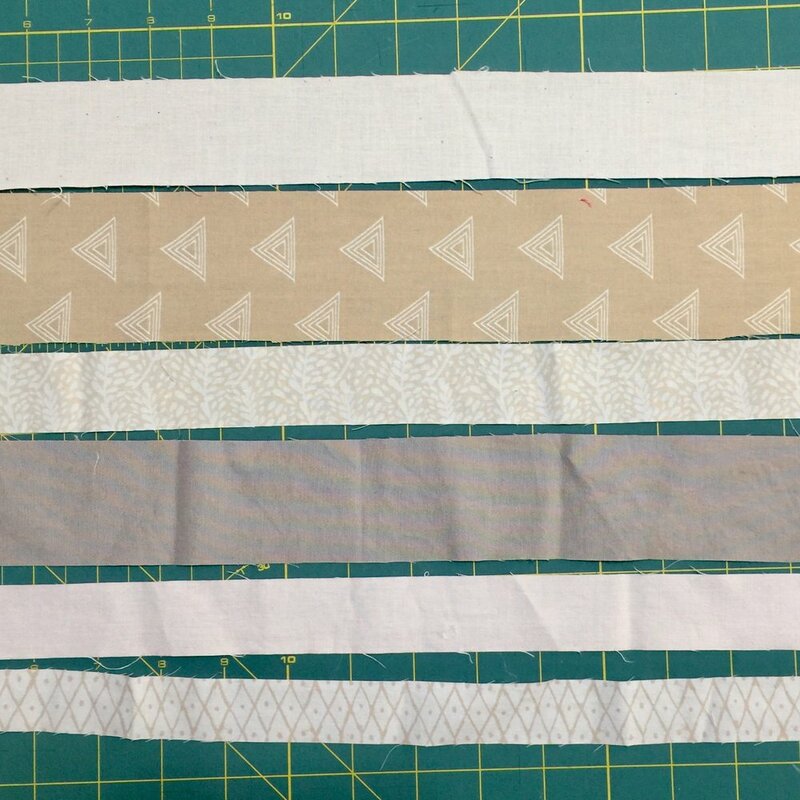 The block is constructed by making a color block rectangle out of scraps in the same hue, then sewing one to two logs around each side before going to the next side—in log cabin (clockwise) fashion. You can also start with a rectangle from one fabric, and use that to build your block. Press toward the dark side. When you’re done, press from the front, then trim to 10.5 inches (10 inches finished).Clip any stray threads and you’re done! Have a look at our step-by-step photo gallery (below) for visual instructions! Start with a rectangle, not a square. Do not center the rectangle. Build your log cabin off center. We look forward to your beautiful blocks at the February meeting. Choose 1-4 scraps from the same color family. Gather strips of various sizes. 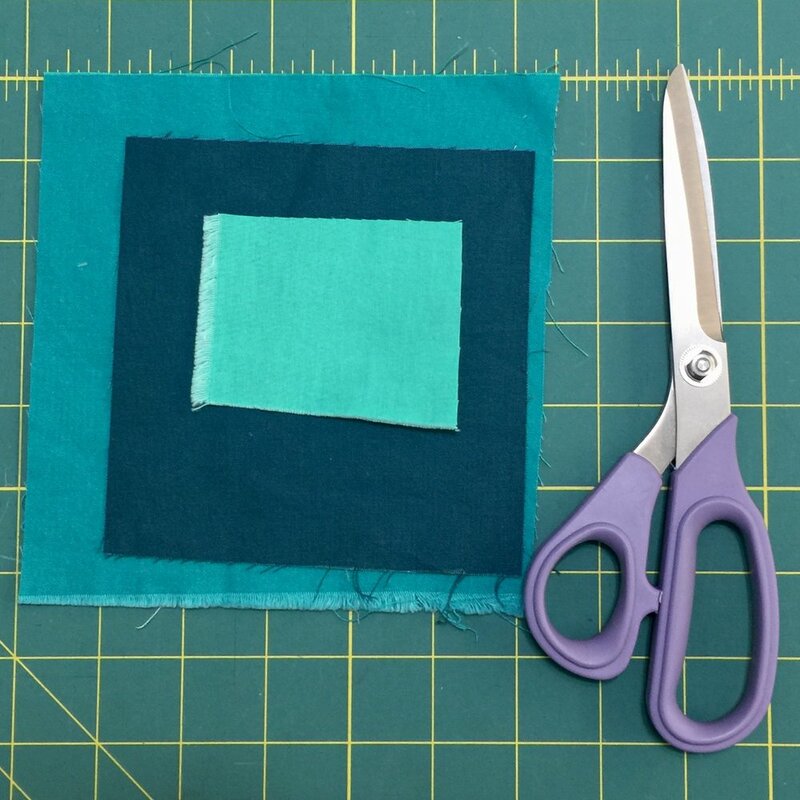 Piece your color scraps together into a rectangle shape. Add strips to all sides. You don't have to work around the block, build strips so that the color block is slightly off center. Trim to 10.5 inches squares. Make more than one! More chances to win.